Blurb: The conflict between man and machine reaches a new apex as Fear Factory embarks on a new chapter with their tightest, heaviest, most industrial record ever. The sound of metallic clanks drenched in reverb enters, leading us into a condemning narrative of humanity’s downfall by its own hand atop a virulent buildup of symphonic atmosphere. Crushing machine gun guitars and drumbeats kick us into high gear, thus beginning the title track of Fear Factory’s latest album, The Industrialist. For 20 years, the industrial/metal juggernaut has deconstructed the parameters by which the two genres are defined, spearheading the heavy metal community’s eventual embrace of technological augmentation, all the while maintaining a signature sound that few have dared to even attempt to imitate. 2010’s Mechanize marked the return of founding member Dino Cazares, instigating a paradigm shift toward an even heavier yet equally melodic dynamic, while Burton C. Bell’s lyrics explored the perpetual conflict between man and machine from a contemporary standpoint. With The Industrialist, the band returns to the heady sci-fi storylines of days past, pursuing a narrative concept with a unique character twist to set it apart from past efforts like Obsolete. This time, the lines between antagonist and protagonist are blurred as the title character – an automaton borne from humanity’s corruption and greed – gains sentience, becoming the source of man’s downfall. 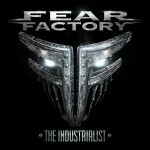 From a musical standpoint, Fear Factory is as excellent as ever, living up to its reputation as purveyors of bone-crushing, circuit-breaking, mind-bending industrial/metal. With longtime associate Rhys Fulber taking up production duties once again, the integration of synthesized elements with the band’s organic yet mechanical approach is as tight as ever. The introduction of programmed drums in the absence of a live member this time around makes for the album’s most notable production feature… or perhaps the least notable as listeners would likely be hard pressed to tell the difference. Case in point, “God Eater” features some fantastic sequences of dark bass wobbles and creeping pianos underscored by intricate tribal-esque rhythms. As well, “Virus of Faith” begins with the sound of machinery in the process of breaking down, the guitars manipulated to provide an atmospheric complement, and the despairing piano and clean guitar arpeggios of “Religion is Flawed because Man is Flawed” make for a thunderous and lush symphonic outro for the assaulting rage of “Dissemble.” Not enough can be said of the human equation as Cazares’ riffs are as powerful and menacing as ever, with some tasteful solos incorporated throughout providing more texture and tonality than to revel in ego-stroking. As well, Bell’s juxtaposition of deathly growls with clean melody makes for a dramatically ambient effect, particularly on the choral qualities of such songs as “Recharger,” “Difference Engine,” and particularly “New Messiah,” whose musical and lyrical themes seem to this writer the logical extension of the album’s – and the band’s – overarching concept. Longtime fans of Fear Factory will certainly find much to behold on The Industrialist, full of grinding mechanized riffs and beats and infusion of outright brutality with introspective melody given depth by the cold synthesized ambience; in essence, the sound the band has pioneered for two decades. Others may find the album to be little more than a repetition of previous efforts, placing too much emphasis on inaccessible heaviness that counteracts the more appealing and tuneful aspects of Fear Factory’s music. Regardless, The Industrialist drives the conceptual framework laid out in such albums as Demanufacture and Obsolete to its logical next step. It is the tightest Fear Factory has ever sounded, representing a progressive step for the band and returning Cazares and Bell to their roots with Fulber’s assistance in merging man and machine.